I admit it—I’m a theme geek. I like a tight plot, complex characters, gorgeous art, an immersive atmosphere and all the other elements that make up a good manga as much as the next fan. But what really makes or breaks a story for me is how well the author handles her theme. Kazuya Minekura is a theme-heavy writer, so I always enjoy her manga. But Wild Adapter is special—a mature, beautifully-crafted series where each individual volume is both a unique whole and a reiteration of the same thematic elements woven from a different character’s perspective but held together using similar threads. The basic pattern for each volume is simple. 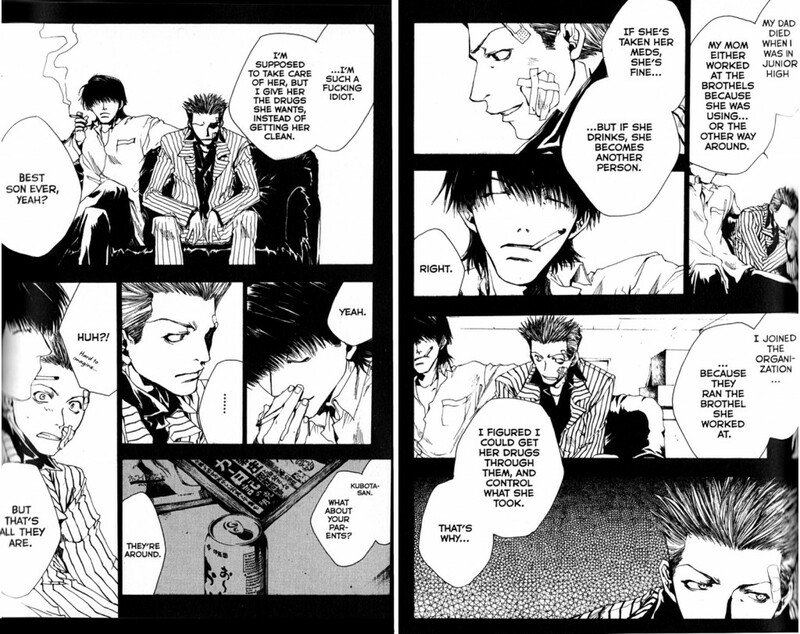 Minekura introduces us to the ex-yakuza Makoto Kubota, one of the story’s two protagonists. She lets us know he’s obtrusively not one of us—a stylishly cool, taciturn, amoral killer with almost no connection to the world of humanity or the vast majority of the people who live in it. And then through the perspective of the secondary characters, she makes him “us” after all—supported and supporting, interdependent, forgivable. And in doing so, she makes the secondary characters—drug addicts, teenage mothers, lonely kids, semi-corrupt cops—all of them stand-ins for the audience in our vast array of imperfection, into a comfortingly forgivable common mass of “us” too. Wild Adapter is especially beautiful because Minekura is strong enough to not make compromises with her theme. She never minimizes Kubota’s violence, never pretends he has values he doesn’t, never makes him suddenly and unrealistically “good.” And yet she never distances herself from him either. You can tell how much she likes him, and how much, in general, the other characters like and trust him too—not in spite of his faults, but because in being with him, they recognize themselves. Genre-straddling notwithstanding, Wild Adapter is a love story. So the places Kubota is most convincingly “us” are in relation to Minoru Tokito, the amnesic “stray cat” he picks up off the street. As is often the case in manga about love, Tokito is Kubota’s compliment—comparatively innocent, easily engaged, outspoken, sincere—basically a nice if somewhat troubled kid. But contrary to common genre tropes, Wild Adapter isn’t a story about how Tokito’s innocence and decency save Kubota from himself. Kubota is himself from start to finish. If there’s saving going on, it’s mostly the kind couples do for each other in real life; providing each other support, making up for each other’s weaknesses, having a place to come home to. Amidst the trappings of action-adventure, Kubota and Tokito’s relationship is reassuringly slice-of-life. 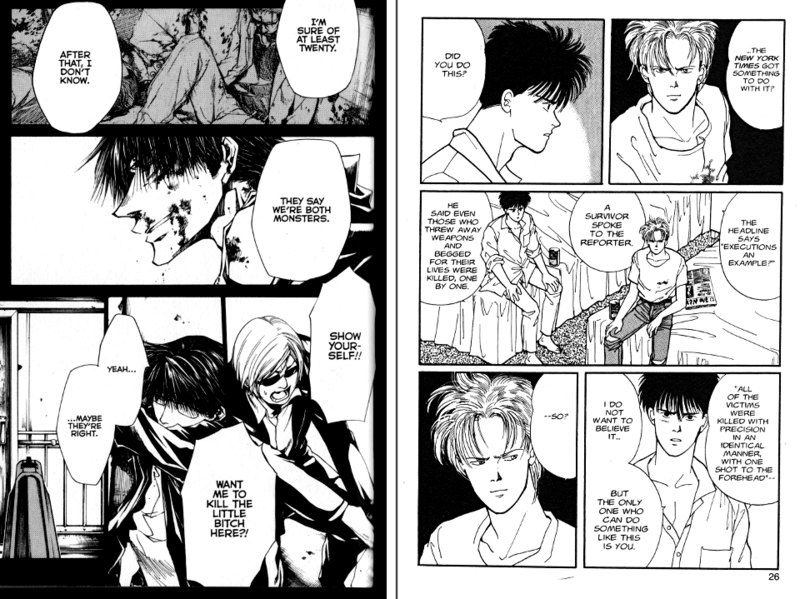 That’s Akimi Yoshida‘s Banana Fish on the right-hand side of the picture above, but I pick on it only because I read it fairly recently and so can still remember which volume the example I wanted was in. There are equally good examples in plenty of other manga too. 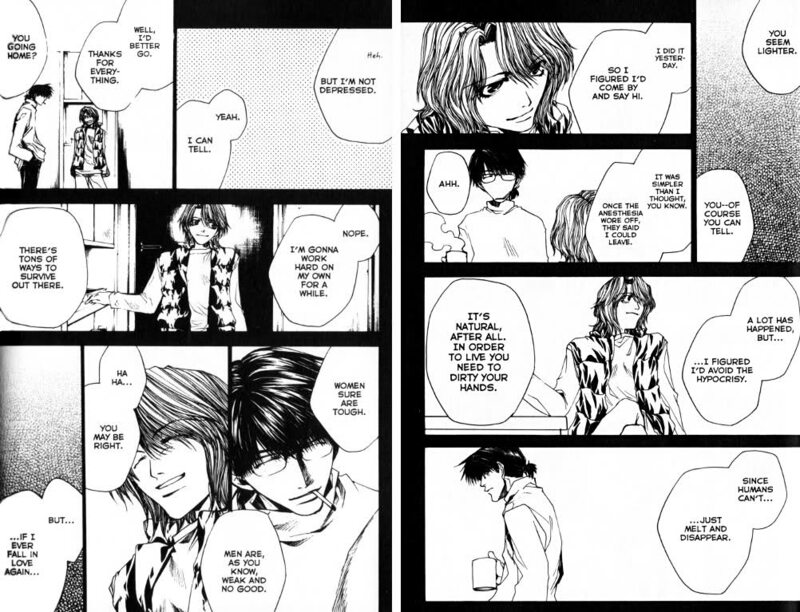 From shounen to BL, it’s one of manga’s most common tropes: You’re bad but I care about you anyway. Tokito, and through him Minekura, never engage in it. Japanese tends to encourage inclusion through vagueness, but Tokito is outspoken and concrete: “We’re monsters,” “We killed so many people,” “Everything that belongs to Kubo-chan also belongs to me.” Even their names include each other. Kubota’s name has protect and field in it; Tokito’s includes assignment/charge and ripen. Reviews often note that Wild Adapter is a deceptively light read. It feels like a guilty pleasure, and you only notice afterwards that it’s actually skillful, well-crafted writing. There are no doubt many reasons the series functions that way; after all, it really is just plain good writing. But I think in the end, one of the major reasons is how perfectly integrated every piece of the story is to its theme. It truly does feel light to have a few hours in which no judgment is necessary or expected, truly is a pleasure to have someone assure us we’re all in it together. Ak- now my head’s gonna swell! Thank you so much for the kind words. 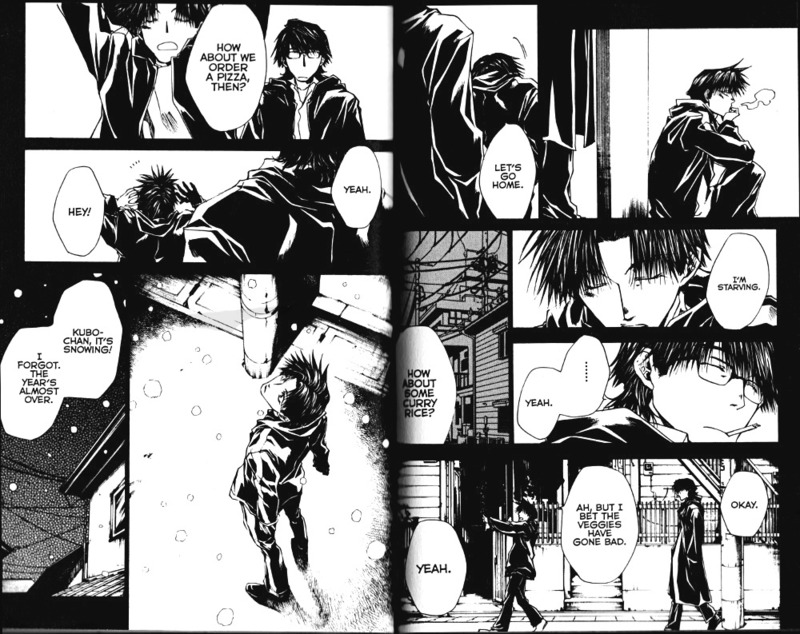 It’s kinda funny really- my post feels so image-heavy to me, and out of all those panels, only one page has anything to do directly with the main plot, lol. Also? This: It truly does feel light to have a few hours in which no judgment is necessary or expected, truly is a pleasure to have someone assure us we’re all in it together. Yeah- this is what puts Minekura on my shortlist of authors I love. You wouldn’t think it would be such a big feat to let your audience suspend judgment for a while, but it’s so seldom carried off successfully that I guess it must be hard indeed.